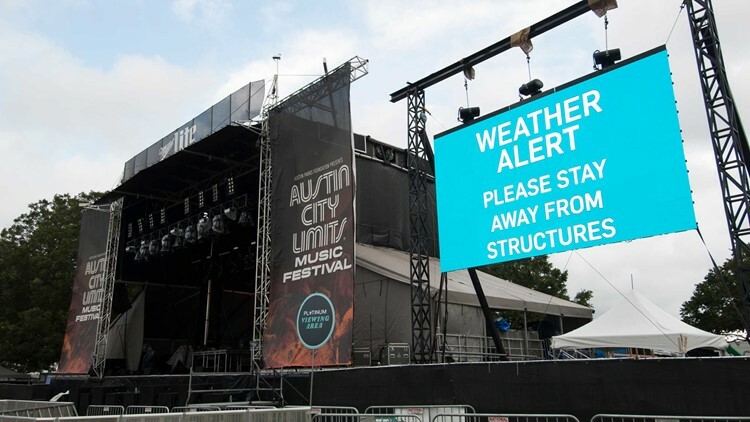 Some delays are possible for Austin City Limits Fest Sunday with scattered showers forecasted for the afternoon, according to KVUE's Jason Mikell. But, delays are likely to be minimal with no threat of severe weather. Gates opened up on-time for the third day of Austin City Limits Festival. However, performance delays are still possible for the afternoon with forecasted scattered showers. Lightning cannot be ruled out in possible showers but flooding is unlikely. Storms are predicted to hit between 2:00 and 4:00 p.m.
Isolated showers overnight brought almost a quarter inch of rain in some areas. For a full forecast click here. Saturday storms delayed the gate opening with festival goers advised to stay under shelter.